This post will guide you how to use Excel MATCH function with syntax and examples in Microsoft excel. 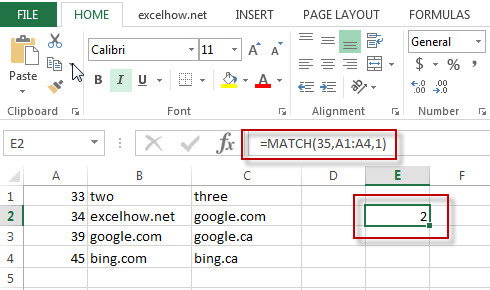 The Excel MATCH function search a value in an array and returns the position of that item. The MATCH function is a build-in function in Microsoft Excel and it is categorized as a Lookup and Reference Function. The MATCH function is available in Excel 2016, Excel 2013, Excel 2010, Excel 2007, Excel 2003, Excel XP, Excel 2000, Excel 2011 for Mac. Lookup_value -This is a required argument. The value that you want to search. Lookup_array – This is a required argument. The data array that is to be searched. Match_type – This is an optional argument. This value can be set as: 1, 0, -1. The default value is 1. -1 – The Match function will search the smallest value that is greater than or equal to Lookup_value. The below examples will show you how to use Excel MATCH Lookup and Reference Function . This Excel Formula will lookup the value “35” and find the largest value that is less than or equal to “35”, it will return “2”, As the value “34” is the only largest value that is less than to “35”. So it will return the position of value “34” in range “A1:A4”. This Formula will return the “#N/A” value, As the Match type is set to “0”, it means that the function will find the first value that is exactly equal to “35”, but it is not able to find the value “35” in “A1:A4” range. This Formula will return “2”, if the Match type is set to “-1”, the Match function will find the smallest value that is greater than or equal to “35”in range “A1:A4”, then return its position.